DANA POINT -- While Great Oak sent its "A" team to Boise to compete in the Bob Firman Invitational, the Wolfpack's "B" teams -- and then some -- were in southwest Orange County for the 45th Dana Hills Invitational. The venerable event is held on a flat 3-mile trek over grass, dirt, asphalt and concrete that eventually winds its way through a crowd -- think a mini version of Pasadena's Colorado Boulevard on Jan. 1 -- across a parking lot and down a slopping access road to the track for a wonderfully fan-friendly lap and a half to the finish. The format stacks the Division I "Senior" races with the elites, regardless of grade, to open the event and the rest of the 22-race schedule breaks down by grade and by gender divided over Divisions I-III (with only D-III Girls Senior/Junior and Sophomore/Freshman as combined races). 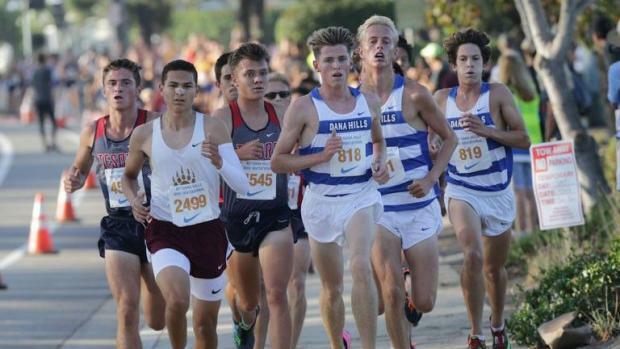 Dana Hills' boys and El Toro's girls won respective titles in the Senior/Invitational Division I races; Simon Fuller found an extra gear late to claim a "home" win in the boys highlight race, and the girls elite 3-miler came down to a battle between two of the best from San Diego. While the Wolfpack boys won in Idaho and the girls ran fast out front (with Tori Gaitan and Arianna Griffiths going 1-2), the rest of the deep Temecula juggernaut was doing a little damage among the warm ocean breezes in south OC. 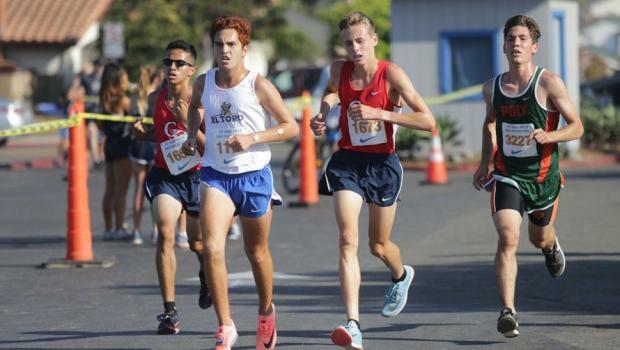 Great Oak, competing in Division I, exhibited its great depth on the boys side. Senior Ryan Shields was the top finisher in the Senior/Invitational race, placing fifth (14:44.1) and junior Cole Sawires Yager was 10th (14:53.6) as Great Oak accumulated 85 points for second behind host Dana Hills (we'll get to the host Dolphins in a moment). Individually, Great Oak had three race winners: AJ Tabanao (15:35.9 in the Junior race), Austin Montez (15:27.7 in the Sophomore race) and Carson Smith (16:30.2 in the Freshman race). As a team, Great Oak won both the Sophomore and Freshman team titles and placed second in the Junior race. Damien Perez placed fifth (15:48.5) in support of Tabanao in the Junior race; Kyle Reden (pronounced "Reed-en") was third (15:38.0) and Anthony Nguyen 10th (16:05.3) behind Montez, and Jaxon Kaeller was ninth (17:11.7) in the Freshman race. The Wolfpack girls weren't as noticeable out front but showed out in the team totals, placing second in Senior/Invitational (by two points behind winner El Toro), second in Junior and first in Freshman. Junior Aubrie Nex was the top finisher among Wolfpack ladies, placing sixth in the Invitational (17:33), with sophomore Lauren Buckley 14th (17:56.0) and junior Kendall Harrison 17th (17:59.9). So, senior Simon Fuller knows the DHI course just a bit. OK, how about A LOT!!! "Jack Landgraf told me before the race that I've run the course more than anyone else here. Probably combined," Fuller said, referring to last year's star runner. "We do this course five times, six times during the summer. We do it for pre-meets, we do it for runs. So, I'm really familiar with this course." 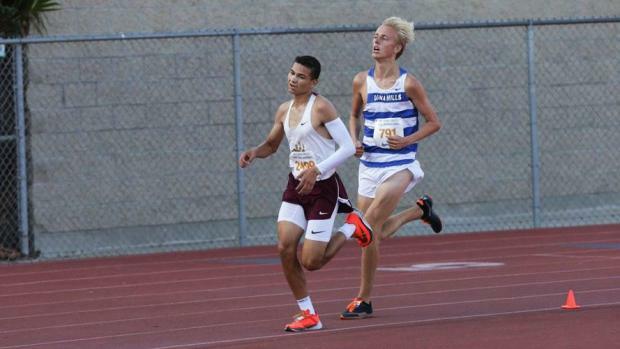 Fuller needed every bit of his institutional knowledge -- and an apparently new addition to his arsenal -- to hold off Jonathan Velasco of Mission Hills (SDS) to win in 14:29.9. Velasco was second in 14:29.9, Bryson Crites (Tesoro) was third in 14:40.2 and Alexis Garcia (Newport Harbor) was fourth in 14:41.7. Fuller was fifth as a junior (14:32.4). Garcia was seventh as a sophomore (14:49.4) and third last year (14:27.8). Velasco and Fuller were shoulder to shoulder onto the track, each trying to take control. "Honestly, until the last 100 meters, I didn't think I was going to catch him," Fuller said about his home crowd-inspired closing surge. "He threw down such an amazing race. It was incredible." Fuller said he's not a kicker "I've never really out-kicked anyone. That's a first for me." In getting the best of Great Oak in the team competition, the Dolphins landed all five in the top 15, had a team average of 14:51 and a 1-5 gap of 0:33. Junior Carrick Denker was ninth (14:52.5, senior Hayden Stein was 11th (14:54.1), senior Garrett Hough was 12th (15:00.2), and senior newcomer Cole Stark was 15th (15:01.4). The Dolphins boys team from a year lost, among them, Landgraf to graduation and Caleb Niednagel, who transferred to La Costa Canyon (SDS). But Stark came over from Anaheim Canyon and is making an impact. Fuller said that Stark ran with him for a lot of the race. "We're glad to have him," Fuller said. "We're not as deep as we were last year, but definitely the team spirit is a lot higher. "We're closer as a team. We've been bonding a lot. That's definitely going to help out in two months when State comes around."